LinkedIn is the world’s largest and most active professional networking platform, with over 13 million companies vying for the attention of more than half a billion users. As such, your LinkedIn Company Page represents a huge opportunity to establish your brand as an industry thought leader and attract top talent. Here are seven steps you can take today to optimize your business page and improve your presence, authority, and recruitment prospects on the platform. If you’d like to learn how to setup your Company Page, our definitive guide to using LinkedIn for business has those step-by-step instructions. Your profile image is first thing people searching for your company on LinkedIn will see, so make a good impression. Company Pages with profile pictures get six times more visitors than those without. Choosing a profile image is straightforward: take your company logo (the same one you’re using on your other social media channels) and resize it to fit with LinkedIn’s requirements. The profile banner above your company logo offers a bit more room for creativity, as there are no hard-and-fast rules for using this space (other than some sizing requirements). How you choose to hang your Company Profile banner is up to you. Here are two completely different examples of company profile banners, and why they’re successful. 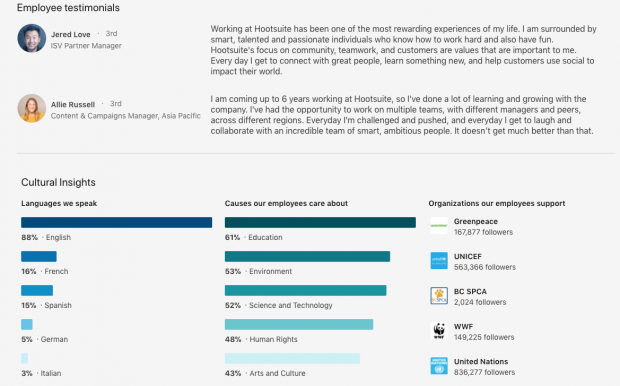 Even a simple graphic can add some much-needed flair to LinkedIn’s standard template. Sephora’s banner displays the clean black and white stripes that frame many aspects of their branding, both in-store and online. Air Canada’s banner takes a more actionable approach, advertising their involvement in the 2018 Seoul Winter Olympics. It includes bilingual hashtags for a current social media campaign and reps Canadian colors, driving social engagement. Carefully-selected images will hook a prospect, but it takes words to reel them in. 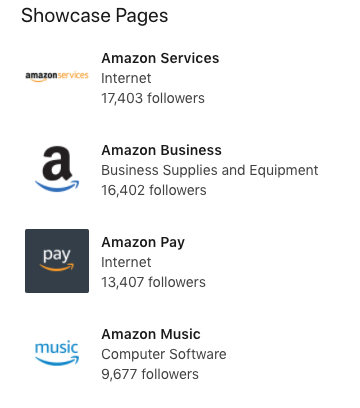 A well-optimized “About us” section on your company page is a tightly worded paragraph (2,000 characters or less) telling visitors everything they need to know about your company. Use simple, accessible language informed by keyword research to outline your business goals in words anyone will understand. How can people contact you to learn more? To see an “About us” done right, look at Shopify. Their bio accurately describes the scope of their main product without ever slipping into yawn-inducing wordiness. My favorite part is how they snuck in “Being awesome” as one of their specialties. This is how you have fun with LinkedIn while keeping things professional. Remember, LinkedIn is a professional space, and like every social media platform, it has its own set of unwritten rules. Don’t be the company sharing memes from five years ago in an effort to market to Generation Z.
Tailoring your content to a business-minded audience doesn’t mean it has to be boring; just read the room, and plan accordingly. URL. Make sure people can find your business’ website by including the URL on your company page. Address. Make sure this is up-to-date. HQ Country. Is your brand global? Indicate on your page where your headquarters is located. Industry. Another key piece of information that people will want to know at first glance. Company size. Let people know how many employees your business has. Having a completed profile will make your profile more discoverable to people searching LinkedIn for brands like yours. If the Company Page is a birds-eye view of your business and its core values, then Showcase Pages zoom in on your day-to-day activities. These highly-customizable pages are essentially tailored news feeds on specific aspects of your organization. Depending on their interests, visitors might come here for content about your company’s individual brands and product ranges, ongoing charity efforts and sponsorships, or regularly occurring events like meetups, conferences, and expos. Real talk: Showcase Pages require upkeep. They have their own distinct sets of followers, separate from your Company Page. If you want these pages to be successful (and stay that way), ensure they’re regularly populated with articles, videos, slide presentations, and any other content that provides your followers with significant, long-term value. Showcase Pages are a great place to share Sponsored Content and get more value from targeted advertising. You can target your posts by location and a recommended number of two other fields, including: industry, company, job type, seniority, group, school, and more. Because people following your Showcase Pages have already shown an active interest in that area of content by subscribing, they’re more likely to read it and share among their networks. Here’s one last secret about Showcase Pages: they’re surprisingly underused. Capitalize on this! Even one Showcase Page puts you a step ahead of the competition, but you can have up to 10—enough to give you a serious advantage. Glassdoor reports that 69 percent of job seekers are more likely to apply to a company that makes an active effort to promote its culture online. LinkedIn Career Pages are an amazing way to bolster your recruitment efforts by showing your company culture in its best light. Located under the “Life” tab, Career Pages feature customizable modules where you can display high-quality images, videos and articles about the day-to-day at your organization. Try to include a URL in every post: LinkedIn reports that posts with links get 45 percent more engagement. If you’re looking for ways to frame your company as a think-tank for fresh ideas, look to the Career Pages “Employee perspectives” section, where you can publish thought leadership articles written by employees. 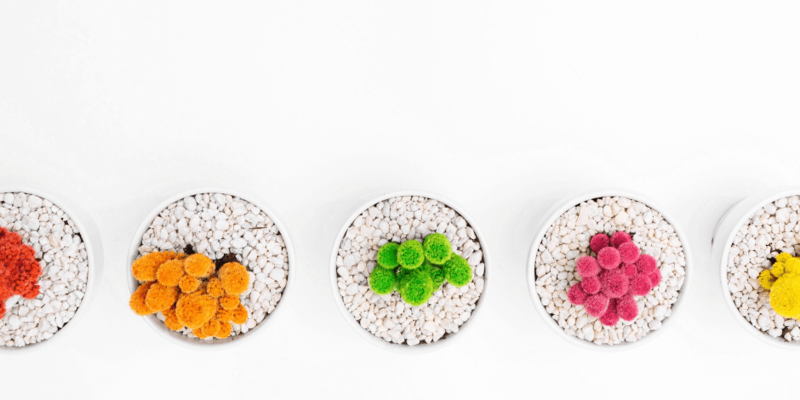 According to a survey by Jumpstart HR, the vast majority of job seekers value personal growth opportunities over anything else when considering a new workplace. By sharing content produced in-house, you’re showing your current employees that their perspectives are valued, and telling future talent that there’s plenty of room for recognition—and the opportunities that come with it. 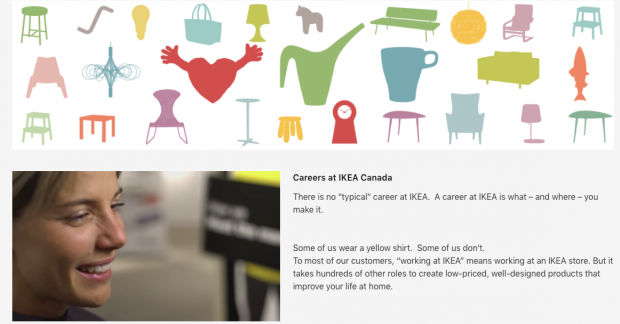 Like Showcase Pages, you should update your Careers Page regularly. This is a space to proudly represent your company as a hub of excellence and new ideas, so post whenever you can; the goal is to have people clamoring to work for you. With a good enough Careers Page, you might even win over a few employees from the Dark Side…I mean, your competitors. More than a billion peer-to-peer endorsements have been given on LinkedIn, the platform’s most powerful (and sometimes controversial) form of social proof. Gather recommendations whenever possible, and don’t be shy to ask for them—it’s almost always mutually beneficial. If your employees haven’t connected with your Company Profile, encourage them to do so, and be sure to write them a great recommendation from your personal profile in return. Your employees’ networks will be notified of work anniversaries, new job opportunities, and other updates about your business. When they share content to their own networks, it’ll also appear with your company name attached. Some of the most valuable endorsements will come from your B2B interactions—76 percent percent of B2B buyers prefer to work with recommendations from their professional network. Whenever you have a positive interaction with another company, whether that’s a vendor, an account manager, or someone you met at a networking event, reach out to them for a connection and recommendation, and offer one in return. This “I scratch your back, you scratch mine” approach almost seems like cheating, but it’s a perfectly valid way to cement business relationships and grow your network. Just make sure you’re following endorsement etiquette by only endorsing people and businesses you have actually interacted with, for skills you can honestly attest to. Another way to build your brand and gather recommendations is to engage directly with customers and followers. If someone comments on an article you’ve shared on your Company Page, or messages you with an inquiry, use it as an opportunity to create a dialogue and win an endorsement. Similarly, if a customer posts about a positive experience they had with your company on another social media platform, you could message them privately and ask if they’d endorse your LinkedIn Company Page, too. Even if you don’t get the endorsement, the positive public interaction is its own form of social proof. LinkedIn publishes an annual list of the 10 best Company Pages. Visit every one of those profiles and study how they’ve optimized their pages, especially if they’re direct competition. Check out the video below for more tips on how to optimize your LinkedIn Company Page. Then implement the tips, start sharing compelling content, and you’ll be well on your way to growing your LinkedIn audience and driving engagement.